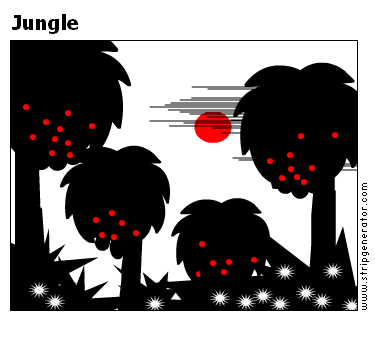 I´m back... for a short while, about a week... but right now I can make a few strips and I continued on the jungel theme... Can anyone guess where I found the trees? I like this strip. Hey - the ligths near the ground are fireflys? Nice! Quel plaisir de vous revoir, Varg !! I recognise the silhoette. The red glowing fruit is very sinister.